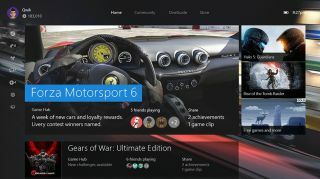 Microsoft has today unveiled the finalized version of the Xbox One interface coming in November that will improve a number of features on the current iteration - the most prominent of which is the inclusion of the much-loved guide function. Leaning heavily on graphic-heavy placecards, the new interface will offer "the fastest and most social Xbox experience ever," according to a blog post on the Xbox Wire. Now, as you might remember, we didn't have the nicest things to say about the Xbox One's new interface that's coming in November. We said it obfuscated a rather simple control scheme, made things slower and harder to get to and hid elements that we found useful. Here's the interface we saw at E3 2015 for reference. But today's announcement changes those thoughts. According to the post, the new Xbox One interface will function more like the Xbox 360, allowing you to press the gem located on the center of the controller to bring up your friends list, party options, settings, messages and more without leaving your game. Using the guide should greatly enhance the functionality of the new interface. And while there are still some questionable aspects like the featured DLC that litter the home page, having the guide is a step in the right direction for an egalitarian system. The Xbox One November update, which includes backwards compatibility, will start rolling out to Preview members in the coming weeks and will launch for everyone else starting in the fall.